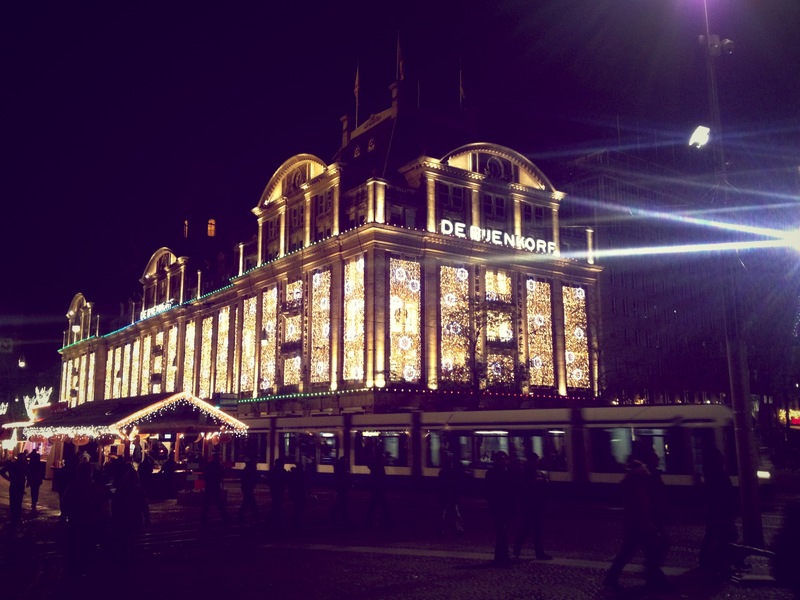 A Goodbye to Holland… for now! My last post before returning home for the holidays. 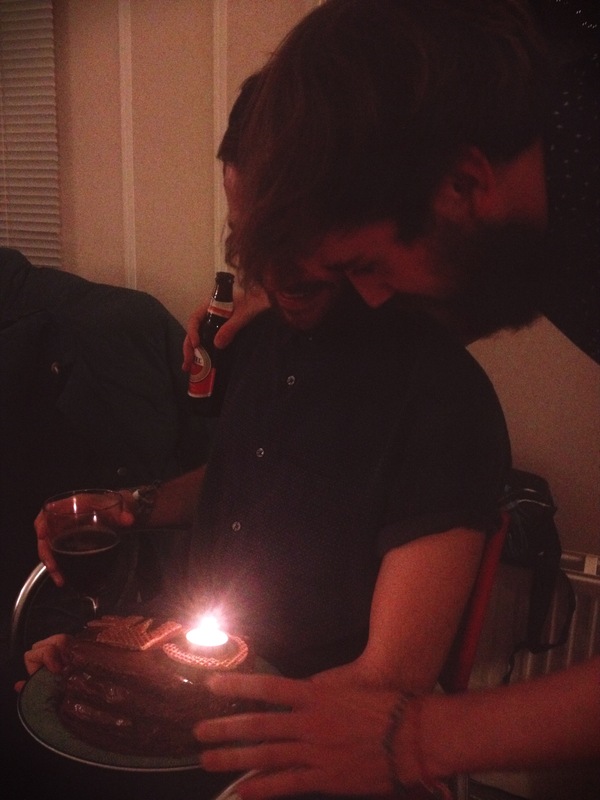 This week has been a whirlwind of emotions, but what else can you expect. I’ll be re-entering a world that I know I love but am also hesitant to return to. I had to say goodbye to some of the greatest people I’ve met in my life. who were only here for the semester. But most importantly I have to leave the most beautiful and magical place I’ve ever been for a month. The time from returning from Prague to Monday had been spent studying for my final and writing three gigantic papers, but this is typical for all of my friends as well. I luckily and somewhat unexpectedly finished two that are due when I’m home, and plan on finishing my last one (a project worth 100% of my grade, thanks Dutch schooling system) on the plane and at home. The time not spent studying was dedicated to planning what I’ll be taking home/bringing back next semester and what I’ll do during my 2 free weeks upon returning to Amsterdam. As you can tell, not quite ready to leave. Monday night was our first goodbye to our dear friend Ivanna. I said goodbye to two more good ones yesterday, Kaitlyn and Divya. I can’t describe the feeling of saying goodbye to people you got to know so well in such a short period of time that you really aren’t sure if you’ll see again. I think these moments were so intense because I haven’t really had to say goodbye like this before. The last time was saying goodbye to my dear love from Claremont who will graduate before I’m back, Biz, but I’m a firm believer that if you’re meant to see someone again you will. And, quite frankly, I know I’m meant to run into her quite a few more times during my life. Ivanna, Kaitlyn, Nat and I made a pact that we’d meet up again in five years somewhere that none of us have been. I know I’ll see Kaitlyn and Jasmin during senior year (just a quick jump up to San Fransisco from Claremont) and I hope to make it to Canada to see my girls that live there, just to do it. 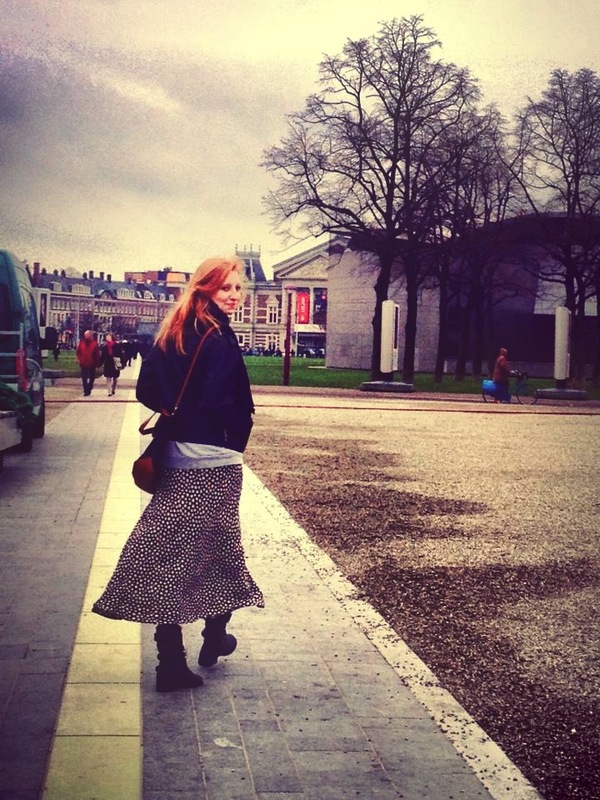 So, thank you, Amsterdam (and overall the world kind of) for supplying me with the best semester of my life. I’m thankful that this isn’t the real goodbye. Thank you for showing me that beauty exists every day in the city and all of its components, the people around me, my friends, the process of change, and in myself. Thank you to the woman who was roller skating down my favorite street a few days ago for making me smile. Thank you to all of the babies and dogs on bikes, sitting in complete bliss, for reminding me to be careless once in a while. Thank you for my friends for teaching me so much about the diversity of our upbringings and how to be grateful for everything each of have experienced, the good and the bad. Thank you to the cappuccino for nursing me back to a human temperature after freezing rides back from class. Amsterdam, I will greet you in January with open arms and can’t wait to share my city with my sister, Zack, and my family throughout next semester. Tot de volgende keer! Liefs, Lily. Prepare yourself for a long one. I returned from Prague last night with my luggage full of gifts and my heart full with love–not even ashamed that I just used that expression. Over the weekend I rekindled my love for my four best friends here (Nat, Jas, Ivanna, Kaitlyn), saw a stunning city with a beautiful history, and yet again realized how blessed I am to be having experiences such as these. I went to Prague basically only knowing that it is “one of the best cities in Europe” and everyone loves it. I also knew that it wasn’t bombed out during WWII, so its beauty was preserved. 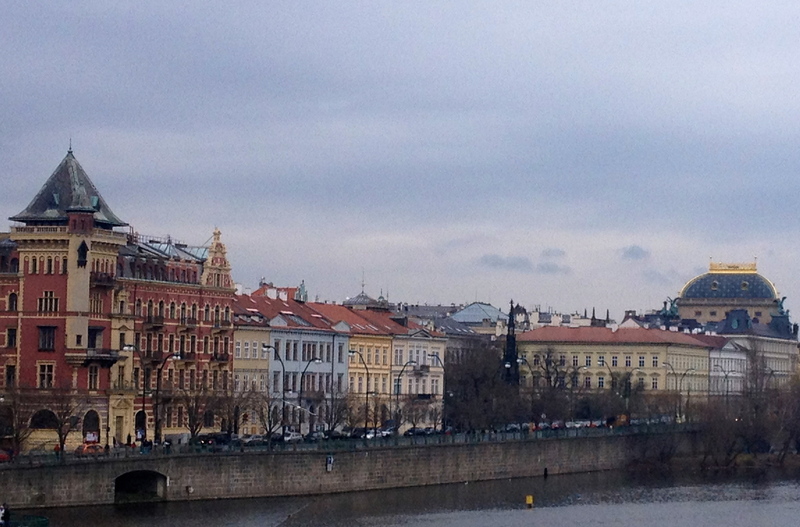 I left Prague knowing it as a city of so much more. Despite leaving Amsterdam in the midst of a “code red” storm that was supposedly destroying Germany and Denmark (our neighbors…) we made it to Prague without much delay. We took a cab to the Old Prague Hostel from the airport and that’s when I realized that there would be a language barrier (similar to our time in Munich) unlike what we are used to in Amsterdam. We still made it with much help from Ivanna (fluent in Ukrainian) that claimed Czech was very similar to her language, score! For those looking at visiting Prague, the Old Prague Hostel is such a steal. 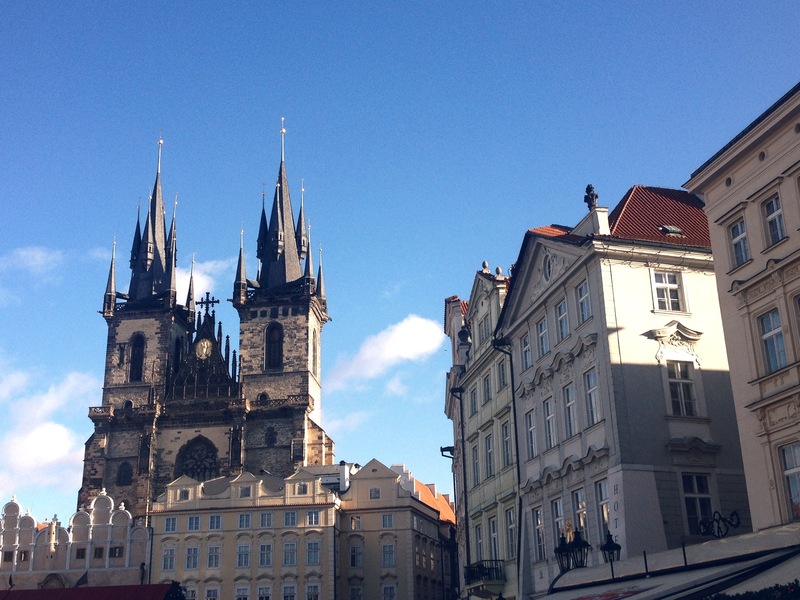 It’s located right near Old Prague Square, which is the home of the huge Christmas market, astronomical clock, a few churches, and restaurants and some nightlife. We paid a little over 10 euro a night for a hostel that was scoured clean every morning, free breakfast and wifi, free towels and other goodies, and most importantly free sandwiches that we took with us every day for lunch and snacks. The employees were incredibly helpful and the nicest people. We stayed in a room that fit 8 (four bunks) and had the room to ourselves the first night, then had 2 then 1 roommate by the end of our stay. Super easy. At the Prague Beer Museum as the tasting began! That first night we spent some time walking around Old Prague (knowing we’d have a big day the next day) and stumbled upon the Prague Beer Museum which had 30 beers on tap. 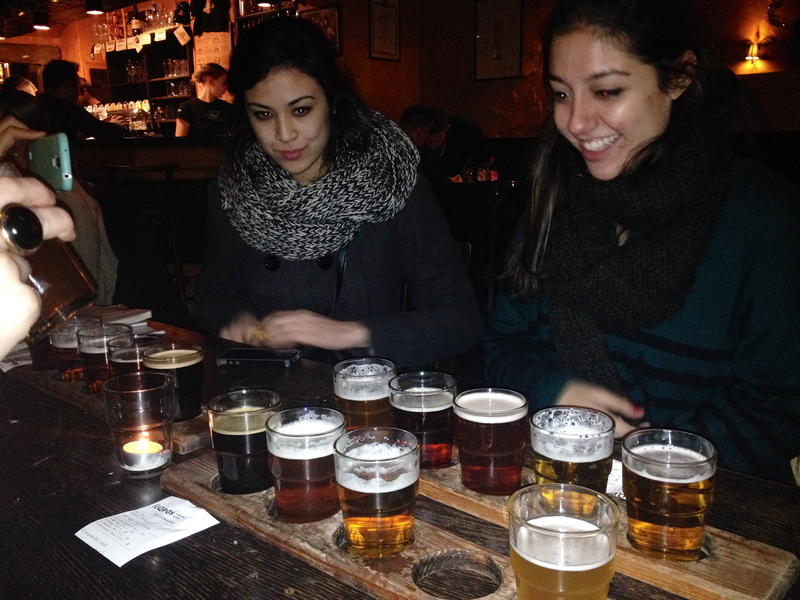 We got 3 trays of 5 beers as tasters, trying 15 beers in total. They were (mostly) all fantastic, but my favorite was Svijany Weizen which had a banana aftertaste. Drinking in Prague (as well as eating) is incredibly cheap, maybe just compared in Amsterdam, but overall it was a great weekend for trying new things. While in the beer museum, we spotted flurries starting to fall outside. First time seeing snow this year, and it made the rest of the trip pretty magical. 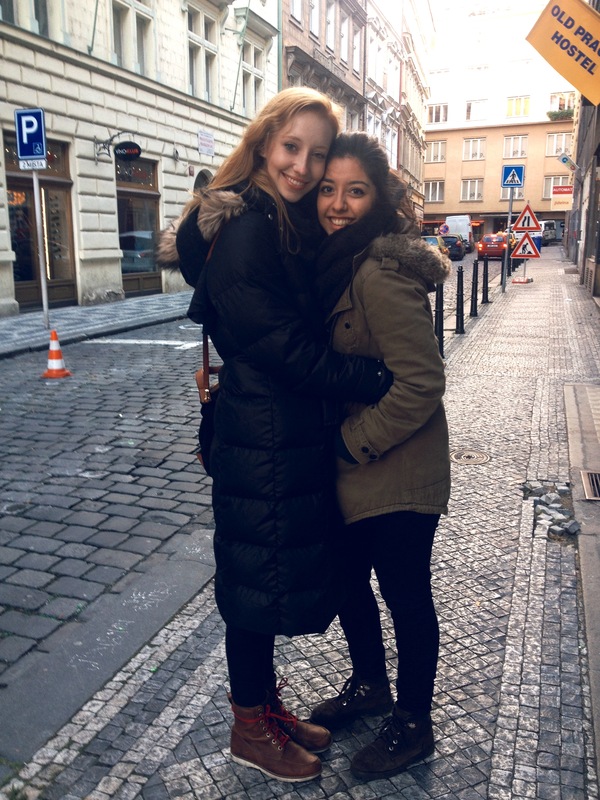 We woke up early on Friday to catch a free Prague walking tour. We missed the tour recommended by the hostel but ended up with Keith, an American from Santa Barbara that fell in love with a Czech woman 8 years ago and moved there (we heard this story twice, went on another tour with him the next day too). He ended up being a great guide and made our weekend even more enjoyable. Let me point out now that Prague was so cold (about 30 degrees F) but with a bad windchill, and this is pretty obvious in my pictures. 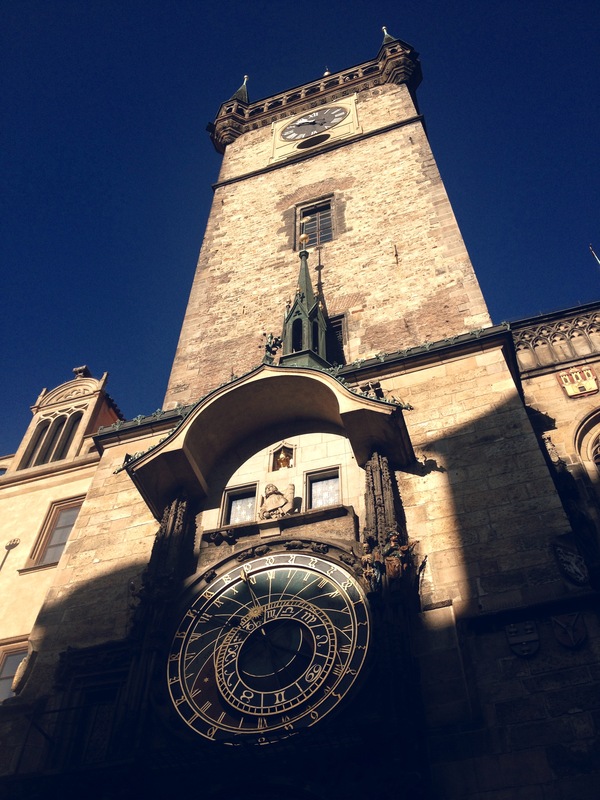 Along the tour we saw the Astronomical Clock and its hourly “performance” of little wooden saints and puppets, the Saint Tyn church, the last standing building in the world where Mozart actually played, Saint James church, the Jewish Quarter, and the Prague Castle from across the water. We learned a ton on the tour but this is what I gathered in general. 1) The Czech have a thing for mummifying body parts of people that have done wrong and displaying them in public (a thief’s hand in the Saint James church, Saint John’s tongue in the Prague Castle), 2) I think Prague is the city in Europe with the most variety of architecture styles such as Cubism, Art Deco, Gothic style, etc. spanning tons of centuries, and 3) Prague is just beautiful in general. My two favorite things on this first tour was seeing that there is a museum in the Jewish Quarter that holds artwork that Czech children made at concentration camps (reminded me of my Girl Scout gold award project) and learning that the Americans going the moon were actually listening to the Czech composer Dvorak as they landed, and the Czech take a ton of pride in this. 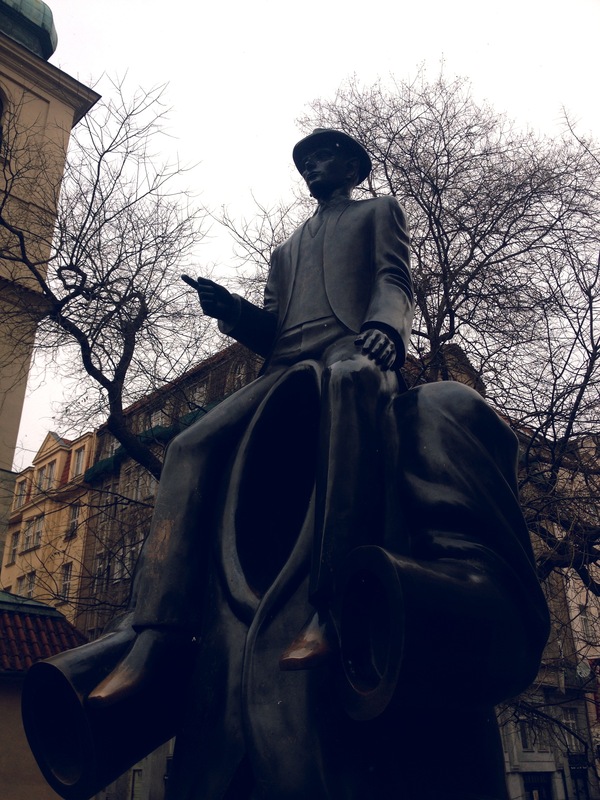 Kafka Statue near the Jewish Quarter. 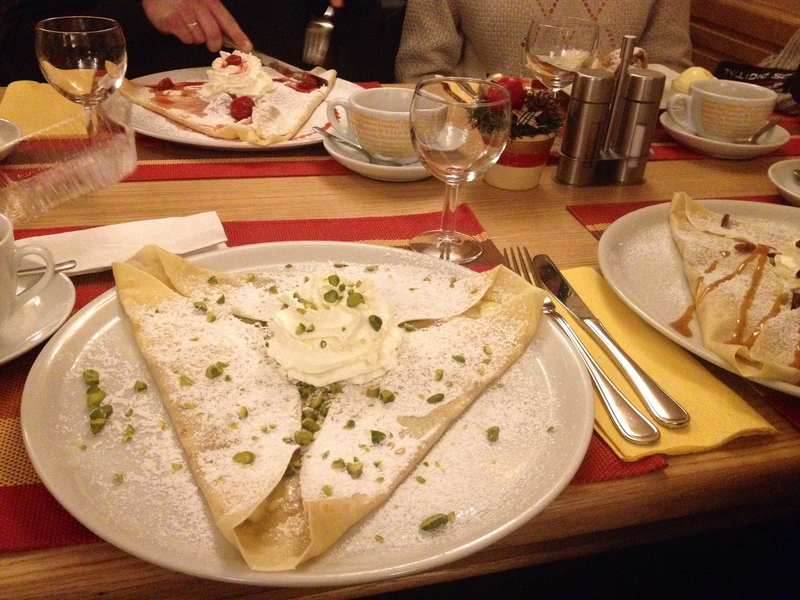 That evening we ate at a traditional Czech restaurant that was just incredible. U Dvou Sester, Czech Kitchen. 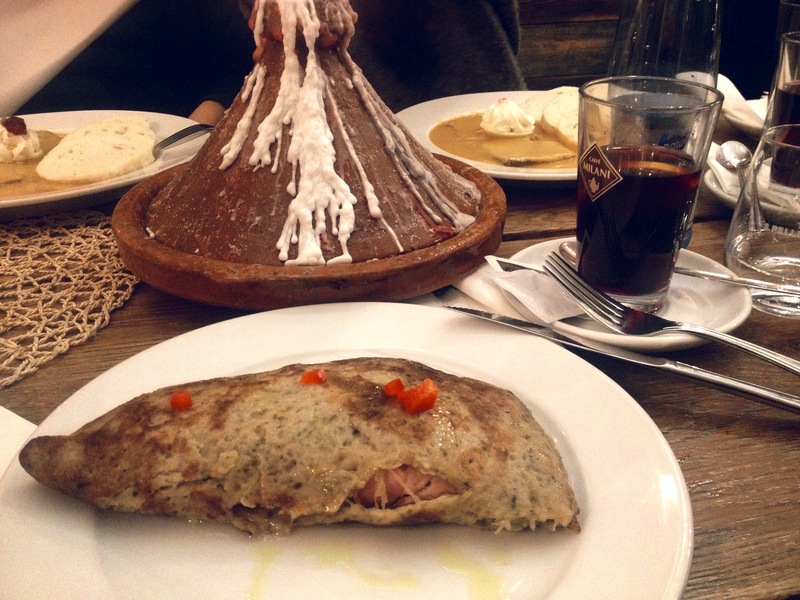 I went for “Cmunda po kaplicku,” a folded Czech potato pancake filled with Prague ham and sauerkraut. The other girls had beef goulash, fried cheese (Dutch classic), and braised beef with a cream and cranberry sauce. We had cabbage salad, marinated brie, and homemade sausage to start with mulled wine. We called this our official feast meal and were ready to splurge, but we only spent about 11 euro each for all of the food and drinks we got. Incredible. After dinner we went to U Sudu, a wine bar that ended up being a bar underground with a network of smokey tunnels and seats throughout them. I actually started feeling really claustrophobic but that passed when I realized how unique and cool it was. We thought it might have been built during the war, but learned it was from the 1600s and that Prague has an entire ancient underground city, and that this was common. There, we met a group of German guys there for the weekend that were all environmental engineers (shout out to Anna! ), and we went to an “electro-swing” club with them afterwards, across the street. We danced the night away to a blend of Christmas music and oldies then three of us stumbled home late (from being tired, of course…), but we didn’t forget to grab a kobasa and sauerkraut sandwich on the way back. The other two showed up later. Dinner at the Czech Kitchen. Saturday we met up with Keith once again for his Prague Castle tour. While the first time with him it was us five and 2 older Australians, this time we had the pleasure of being with maybe 10 more American exchange students… and they were annoying. I don’t think we gave off vibes quite like them. On this tour we crossed over the Charles Bridge (super famous with a ton of creepy saint statues), saw where the Czech Republic is actually run from and some great views of the city, and I ran into MARGARET. I was staring up at the incredible cathedral in the castle and heard a loud “LILY!” followed by a huge hug. I love her so much and was so surprised. I ran into her AGAIN in Old Prague Square the next day, insanity considering there were so many tourists out and about during the weekend. Anyway, Keith left us at the castle and we made our way down ourselves, stopping at a little crepe restaurant for a snack before heading back across the bridge and back to rest for a bit. 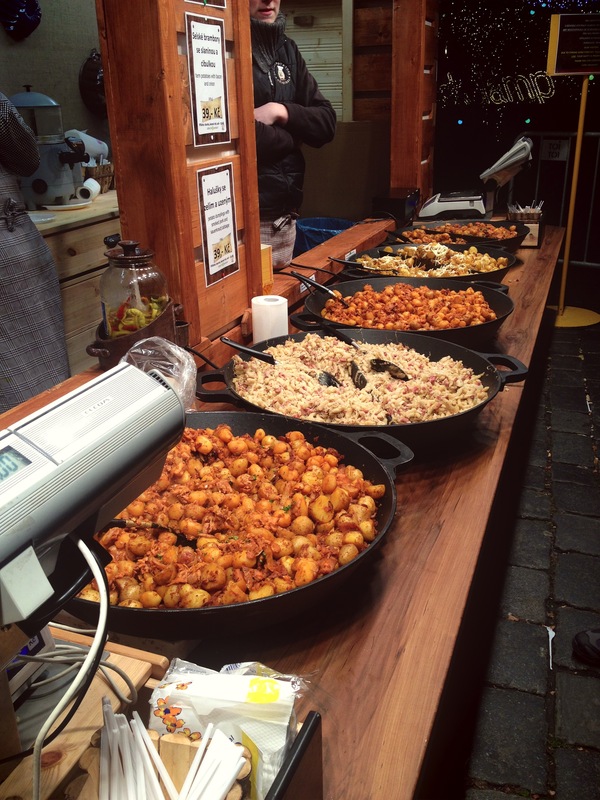 We grabbed dinner in the Christmas market (more sausage, potato dishes, fried cheese, cheap stuff!) and went to Popocafepetl afterwards. This was another bar tucked underground, much smaller than the scary labyrinth from the night before, but pretty gezellig. Before crossing the Charles Bridge. 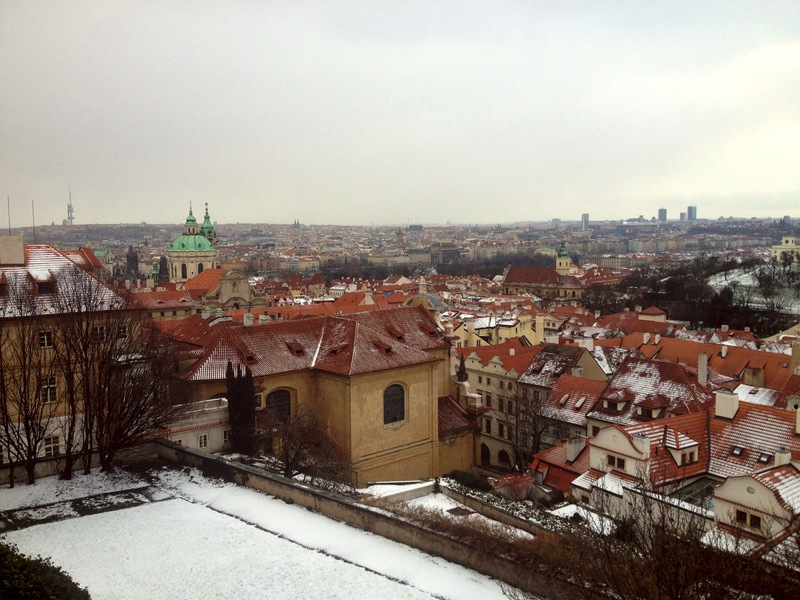 View from the Prague Castle. Food at the Christmas Market. On Sunday we decided to get up early and cross the Charles Bridge again, but try to catch it with less tourists. 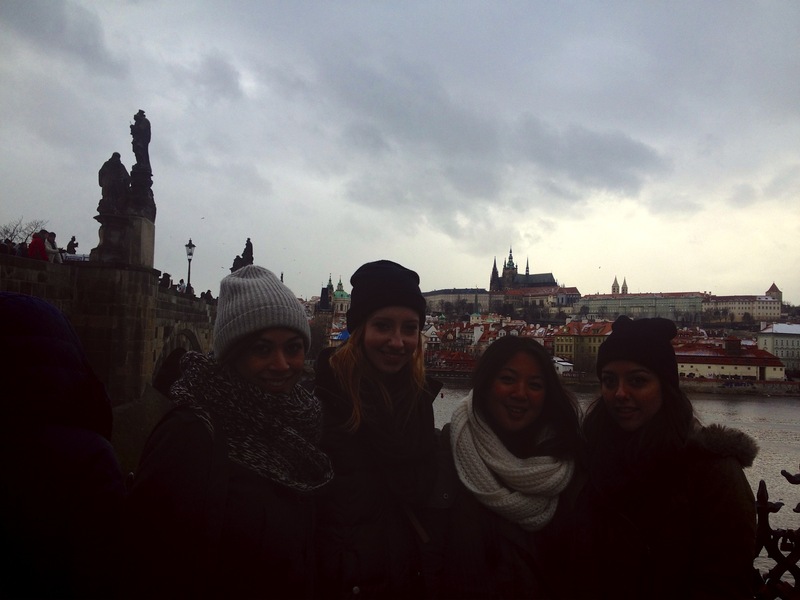 We were successful at this, and saw more of beautiful Prague than we could have the day before. 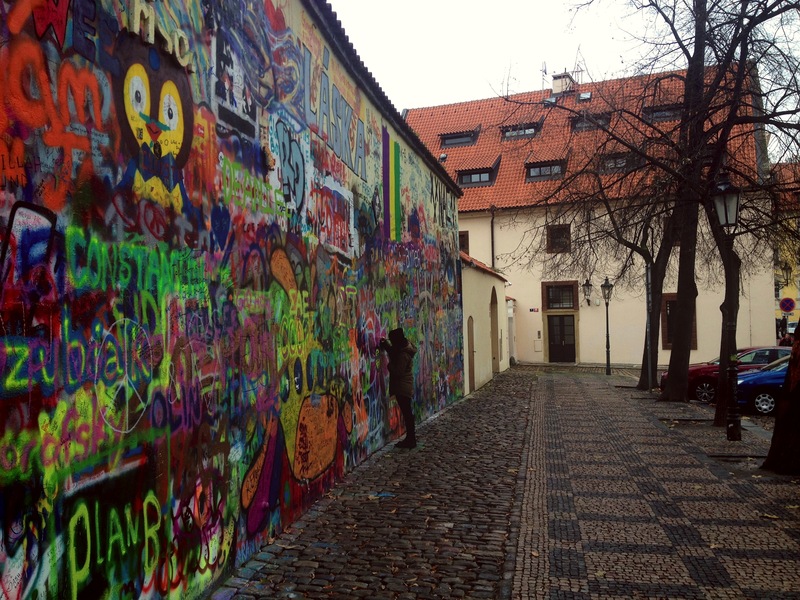 On the same side as the Prague Castle, we were able to see the David Cerny baby statues and the John Lennon Wall. David Cerny is a controversial Czech artist that I think I’m in love with. These huge creepy babies and other statues are scattered around the city, but we caught a few in a smaller park near the Lennon Wall. The wall was fantastic to see. 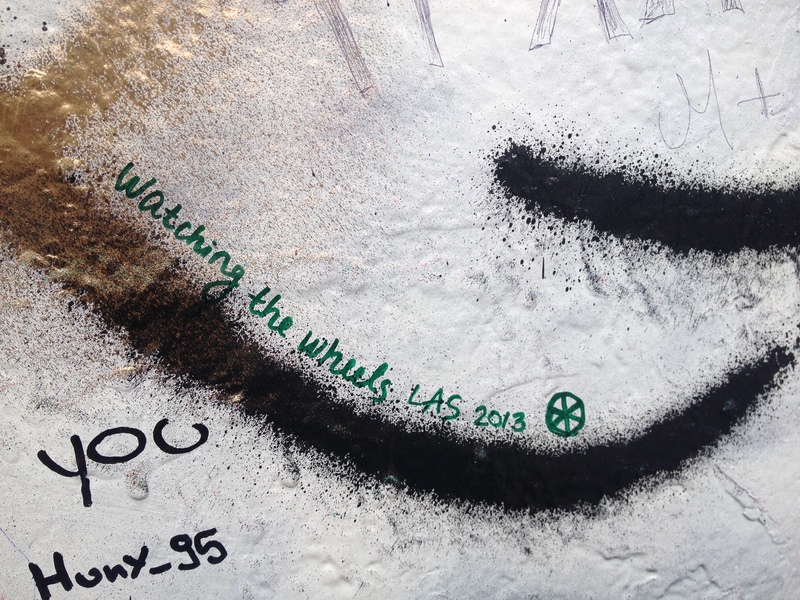 I knew it was super touristy, but considering my foot tattoo is a representative of Lennon’s song “Watching the Wheels,” I had to go, and sign it as well. We all left our marks. As we headed back to Old Prague Square, we ended up running into a Ukrainian protest which Ivanna and Kaitlyn joined and followed throughout the city as Nat, Jas, and I went exploring other areas. We met up later to say bye to Jasmin (left a night early) and rest up before our last night. 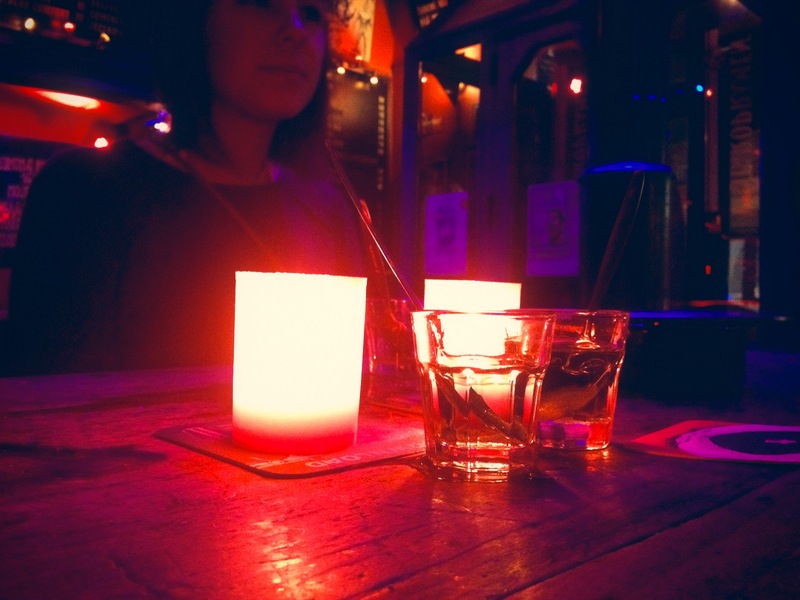 That night we went to a well-known Czech bar/club, Chapeau Rouge, that was kind of voodoo themed and definitely represented Prague. I’ve had my fair share of trying weird things (I am a college student and now a traveller afterall) but Absinthe is quite possibly the worst thing I’ve tried. It is a huge thing in Prague and we decided to go for it. I can only describe it as spicy Jagermeister literally on fire that continues to burn you for a while afterwards. But alas, we did it. We enjoyed our final night together but knew we’d have to get up and check out the next day. 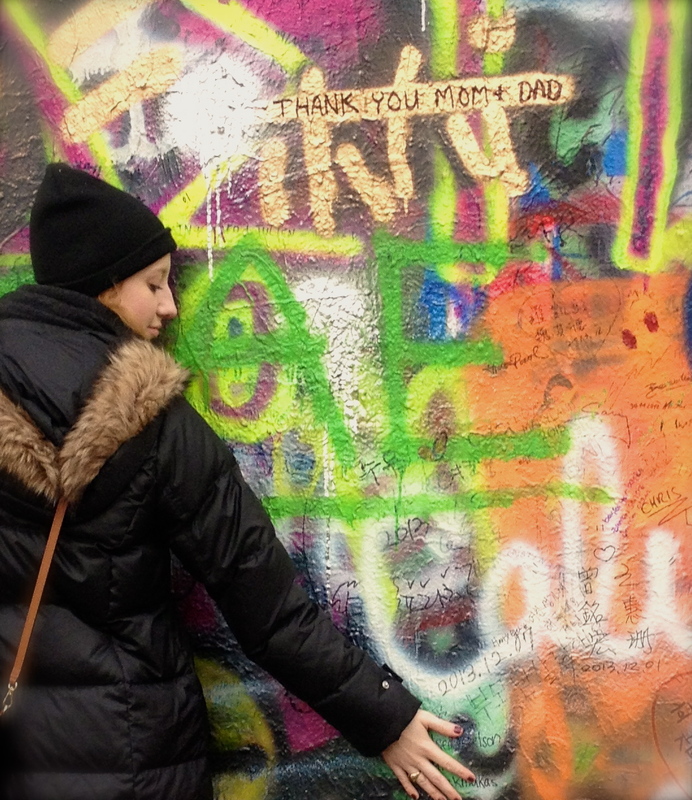 Nat leaving her mark on the Lennon wall. My mark on the Lennon wall. Monday was a day of relaxation, some homework, and travelling home. I was of course happy to be back in Amsterdam, but Prague was such a nice place to be. Arriving home was also the sobering moment when we all realized that real life starts again and the first semester finishes in now just nine days for me. I have plenty to do until then, but putting everything aside for a beautiful weekend was well worth it. Děkuji Praha, it was so nice to meet you. Almost Christmas. Once it turned December (yesterday) it really hit me that time has flown. As I say to myself every single day, thank God I have another semester here. I’m going to list a few highlights (or exciting things at least, some are bad) that made this week different from the past few. Feeling a little repetitive, but hey, this is normal life for me now! So yes, Ryann came to visit me from Galway, Ireland from Tuesday until Friday of last week (Sra. Wheeler, she says hi!) I quite liked having a visitor during the week, as we were more low-key but still got out around the city. 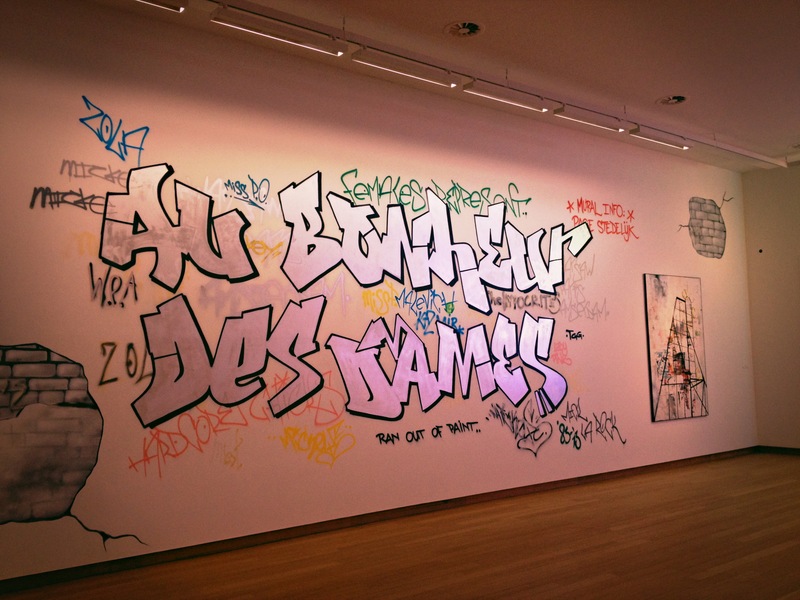 I let her explore on her own while I went to a lab on Thanksgiving, but I was also happy to take a break and see the Stedelijk museum, the modern art museum which I hadn’t seen yet. My Thanksgiving would have been even more depressing if she wasn’t here as my roommate was in London with some of her family. A few kids in my building tried to get a meal together but couldn’t (none of us have ovens), so Ryann and I opted for Kraft mac and cheese from the American food store (I hadn’t been there before! ), added some bacon, I made an autumn salad, and we watched Louie on Netflix while we ate. Nat (not even American) was the first to tell me Happy Thanksgiving that day. I guess I’m just not very festive. It was definitely hard to see people with their families and friends on Facebook and Instagram, and it really made me miss home. It only took a few seconds for me to realize that not only do I have an incredible thing going for me here, I’ll be home before I know it and for longer. 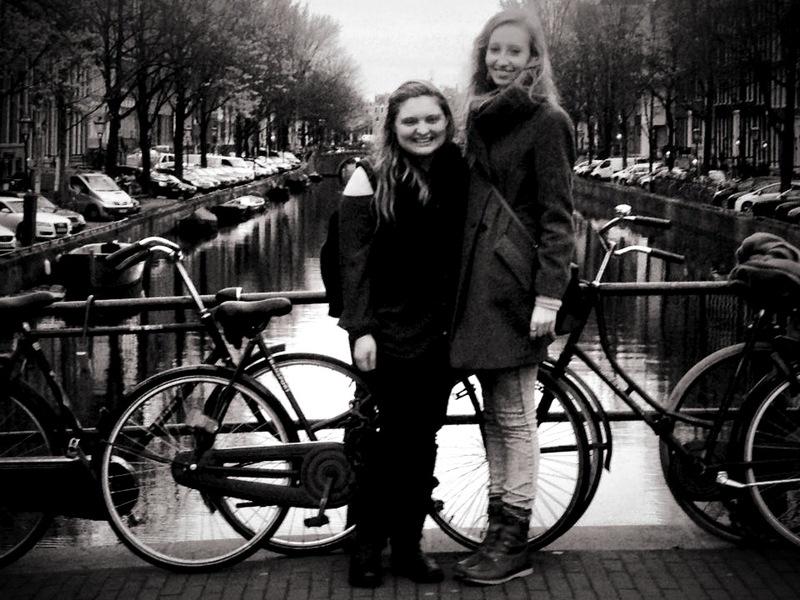 Ryann and I on a canal, so classy! I’ll be headed to Prague on Thursday and it’s supposed to snow there. I’ve made a list of what I want to do and couldn’t be more excited. Puppets are big there, and so are other magical things. But I’ll leave all of that for my next entry. Stay tuned!